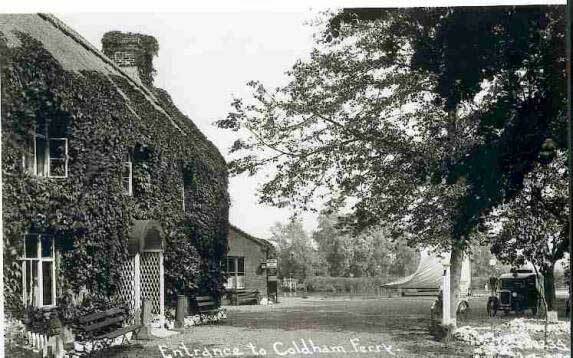 Coldham Hall Sailing Club was formed in 1951 by a group of local boat owners. 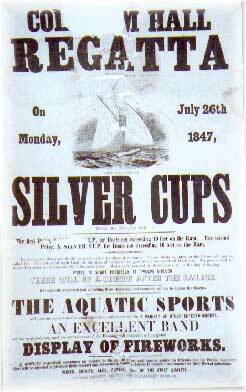 There had been a Sailing Regatta held at Coldham for many years, in fact we have a programme dated 1847. This poster was used as backing for a sampler made in 1847 by 9-year-old Mary Ann Powley, of Surlingham. She later married a Master Mariner, George Sharman, also of Surlingham, who was lost in the great gale of 1882. The sampler was brought back from Australia in 1984 by her granddaughter, Mrs Mary Jennings, and is now in the Strangers' Hall Museum, Norwich. The first President of the Club was Billy Breach, landlord of the Pub. In the early days the Club and the Pub were almost one and the same thing. The early success of the Club owes much to the support of Harry Last who ran the Boatyard and succeeded his Father- in-Law, Billy Breach, as landlord from 1954 until he retired in 1973. By 1956 the Club had 30 boats, including 13 Norfolk One Designs, 5 Waveney One Designs, a 14ft International, an 18ft National, a 12ft National and a collection of interesting Half-deckers.By 1960 with the advent of the relatively cheap plywood dinghies such as the Enterprise there was a gradual change. Also, at that time we had 5 boats sailing on a scratch handicap, 4 International Star Class and an Uffa Fox 23ft converted Airborne Lifeboat. Until 1968 the policy of the Club was sailing for its own sake, but we had to bow to pressure and accept trophies donated to the Club and this was the start of Trophy Series Racing. Until about 1970 the club was based in the Pub, but we were attracting more families and persuaded Harry to let us use part of the Tea-room as a Clubroom. When Harry retired in 1973 David Pugh took over as landlord and soon began to make changes. The Pub was redeveloped to enlarge the Bar and Lounge. The Tearoom and Workshops were demolished and a Car Park was provided where the caravans parked. The grounds were also landscaped about this time. David offered the Club to rent the Wet Boathouse, which we converted into a Clubroom which served the Club very well until 2002 when the prohibitive cost of repairs together with ever rising tide levels which flooded the floor, forced the Club to abandon the Clubroom. The Club has now constructed a new Club house in the Dinghy Park the official opening of which took place at the annual rigging out supper on the 26th April 2003. At the time of obtaining the Wet Boathouse the Club was also able to rent the Dinghy Park and 12 deep water moorings. The Yare Navigation Race was started in 1975 as a race for traditional Broads Sailing Cruisers, sailing from Coldham Hall to Breydon Water and back. This race has been a great success always exceeding the 60 boat target. By the 80's we had 16 Sailing Cruisers on the books and the Wayfarers and Yeomans were taking over from the Waveneys and Enterprises. But we were always able to attract an interesting selection of craft, including an Uffa Fox Sailing Canoe, an Uffa Fox 20ft restricted class, two Uffa Fox 23ft converted Airborne Lifeboats, Waveneys, Norfolks, Enterprises, Fireballs, Merlins, Laser, Punts,Int 14ft Int 12ft, National 12ft, Albacore, Star Class, Osprey, GP14ft, Wayfarers, Wanderers, Yeomans and various half-deckers. 1989 saw the purchase of our first rescue boat, and in 1996 the Club was able to purchase 3 Wayfarer Class dinghies for Club use, and was then able to initiate a Sailing Appreciation Course. This takes place on weekday evenings in midsummer. For a small fee people can join the course and be given initiation in the art of sailing by competent club members. This has lead to an increase in membership. In 1999 one of our founder members, Jimmy Upton, had to give up sailing due to ill-health and generously donated his Yeoman "Mill Chic" to the Club. Jimmy died soon after, but his name will be remembered each time that Mill Chic sails. Mill Chic. A Trust was established in June 1999 when Jimmy Upton donated his Yeoman, sail number Y72, to the club to be maintained and used by members for racing or cruising. A syndicate of club members maintains the boat, pays for all costs and arranges the usage by syndicate members. Any member wishing to join the syndicate should contact Ian Shepherd for details and availability. The Club Sailing season starts with the Open Regatta in early May, then the Club races every Sunday, sometimes locally and at other times down-river. During the season we usually have two Picnic Races for more social sailing. The Club also holds a Club Regatta in mid-simmer and also we have an Open Day when members of the public can come and try sailing with us. We also have a Club B.B.Q during the summer. The Y.N.R. takes place in September, and the Club sailing continues till the end of December. The Social side of the Club includes an Annual Dinner and Prize-Giving at the end of the season. After Christmas we have a Social Evening in February, followed by a Fish'n Chip/Talk in March, and a Fitting-out Supper in April. Coldham Hall Sailing Club is a very friendly club, and visitors are always welcome. We are fortunate in having a lovely stretch of river here, wide, relatively quiet, and a good Pub to come home to.